Benjamin Franklin? Thomas Fuller? Apocryphal? 1) Write something that people wish to read. 2) Do something grand that inspires people to write. The famous statesman Benjamin Franklin has a secure place in history for both of these reasons. Apparently, he crafted a remark that was similar to the one above although he was more eloquent. Would you please locate this adage? 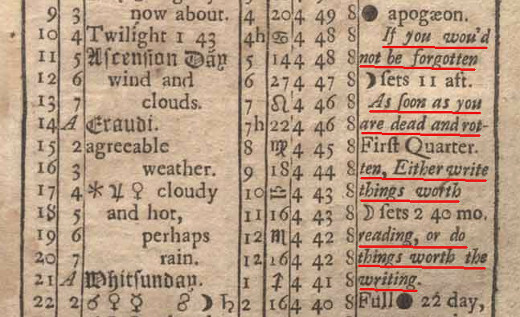 Many of the sayings in the almanacs were not coined by Franklin. He read several contemporary compilations and sometimes selected statements he found interesting. He also rewrote existing adages and even combined sayings. If thou wouldest win Immortality of Name, either do things worth the writing, or write things worth the reading. As he revised it, he thought of a common lugubrious verse on samplers, which in one version said, “When I am dead and all my bones are rotten / If this you see Remember me and never let me be forgotten.” He put together and revised the learned saying and the folk rhyme. The combination of a folk and a scholarly saying seems typical of Franklin’s egalitarianism. . . 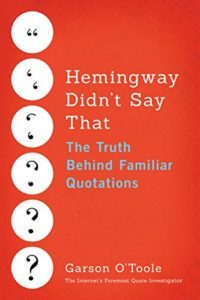 In conclusion, Benjamin Franklin did construct a saying of the type described by the questioner and placed it in his 1738 almanac; however, he apparently built it using two sayings he had encountered previously. Thus, the lineage was mixed. Thomas Fuller can be credited with the simpler statement in his 1727 compilation although he may have been recording an adage that was already in circulation. Image Notes: Portrait of Benjamin Franklin circa 1785 by Joseph Duplessis. The painting is now located in the National Portrait Gallery, Washington D.C. Image accessed via Wikimedia commons. Part of title page of Benjamin Franklin’s 1738 almanac. Part of the page for the month of May in the 1738 almanac. Images have been cropped and resized.